Rebuild Cleveland: News from "The 9"
Geis Companies is rapidly approaching the fulfillment of its goals to transform the abandoned Ameritrust Tower into an urban oasis known as "The 9." "We haven't missed a date in 46 years," said Greg Geis as quoted in the most recent coverage by cleveland.com's Michelle Jarboe McFee. Apparently, they don't mean to miss one anytime soon, as they add a third shift to the construction crews as they ready the 1970s-era, 29-story complex for luxury apartments, a hotel, rooftop bars, restaurants, and an urban grocery store. Their completion and grand opening target date is in September of this year. The first open house giving the public a sneak-peak at Geis' product happened today, March 25. According to the latest article from Crain's Cleveland Business, about six out of the 194 planned apartments were leased the date of the open house. Two of these suites are palatial 3,000 square foot penthouses, renting at an astonishing $5,995 per month--a number scant seen in most cities in America, much less downtown Cleveland where residential rents tend to stay around the benchmark $1/square foot/year area. The smallest luxury apartment clocks in at 318 square feet and a $1,500 price tag, or $56/sf/year! Apartment dwellers may avail themselves of the onsite concierge, valet parking, laundry, room service, and housekeeping, provided by the hotel staff. 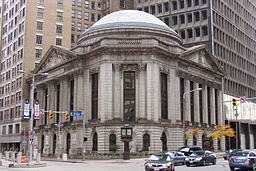 Also on premises is an indoor dog park and a Heinen's boutique supermarket in the historic Cleveland Trust Rotunda, adjacent to the tower. In all, Geis will have invested over $170 million into this project, financed by a checkerboard of sources including the owners' personal credit. The result will be 194 apartments, a 156-room Metropolitan hotel, a Heinen's supermarket, three bars including one on the roof and one in a bank vault, a movie theatre, office space, and a dog park, all in center of the city's financial district and the crossroads between Public Square, the Gateway sports and entertainment district, and Playhouse Square. This sparkle of life in an office-dominated district will do wonders to stitch together the downtown area, whose residential and entertainment areas are very much balkanized. The Ameritrust Tower has a bit of a checkered past. 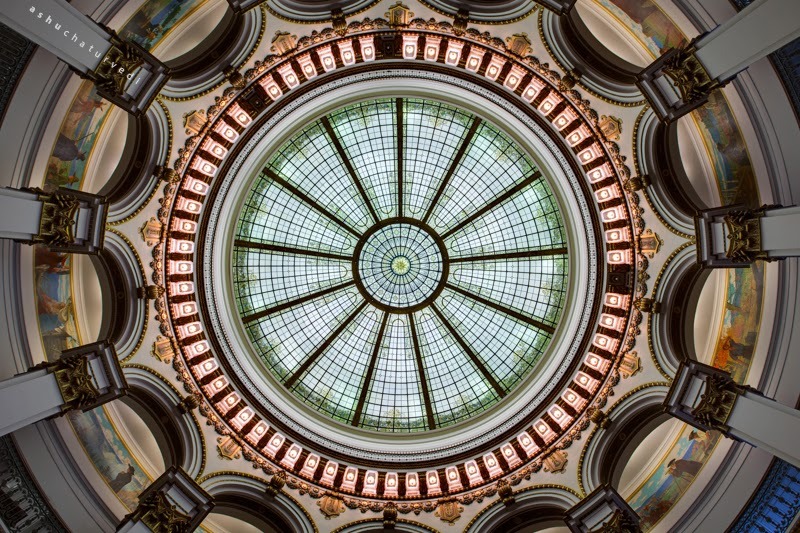 Built in 1971 as the headquarters of the Cleveland Trust Company, it was built adjacent to the iconic 1905 Cleveland Trust Rotunda (pictured below), with its immense stained-glass window dome, intricate brass and wood trimmings, and murals featuring various depictions of American history. Cleveland Trust Company changed its name to Ameritrust Corp. in 1979 to reflect its growth on its way to becoming the 6th largest bank in the country. In the late 1980s, Ameritrust fell on financial difficulties and was acquired by crosstown rival Society Bank, which later became Key Bank via merger in 1994. The last tenants of the Ameritrust tower moved out in 1996, and the tower has been vacant ever since. In 2005, the county purchased the building for $21.8 million, or about $4.9 million above a commercial appraisal conducted just two years later. At the time the county planned to renovate it for a new county headquarters, but council discord led to the application and approval for the demolition of the tower. Later, the council changed its mind again and decided to try to sell the building to private developers. After six long years of failed agreements and county council turmoil (including several FBI raids that resulted in the conviction of several officials and a complete reorganization of the structure of county government), the county finally struck a deal in 2013 to sell the entire complex to Geis Companies for $27 million, in exchange that they build a new county headquarters adjacent to the tower and lease it back to the county at $6.7 million per year for 26 years.